In Chrome, You may get some SSL certificate errors while browsing specific pages. Now, You will know how to fix ERR_CERT_SYMANTEC_LEGACY error. There may be several reasons behind this error. But, You may become surprised to know that chrome and firefox officially don’t support old Symantec SSL anymore. So, If this is the case, you may have a very little to troubleshoot this problem. Whenever this problem appears in your chrome browser, you may see the following messages. But, You have options to solve this issue. Before getting through the actual solutions, make sure the time and date settings are correct in your PC or mobile. Because, Sometimes, Incorrect date and time may be the reason behind this type of problem. By the way, To get rid of this connection error, follow these methods. In some cases, third-party extensions on chrome may cause secure connection errors. So, You should browse in the guest mode to see if you can visit that problematic web page. If you can, disable all the extensions and see what happens. You can enable them one by one. By this way, You can easily find which one is causing the problem. Then, You can disable that extension. By the way, Here are the steps to follow. To enable guest mode, click on the profile icon on the top right corner and choose Open Guest Window. To disable extensions, type chrome://extensions/ in the address bar and hit enter. It will lead you to the extensions window. From there, You can enable or disable anything you want by tweaking the switch button. I hope, by this way, you will be able to solve err cert symantec legacy error. Sometimes, The third-party firewall or antivirus may create this problem. So, You can try to disable these security programs temporarily. Or you can tweak specific settings from that antivirus or firewall. It may fix ERR_CERT_SYMANTEC_LEGACY in chrome. At first, Try to visit the problematic website using Google Chrome from other devices and network. If you still see the error, it might be a problem with the SSL certificate installed on that website. In this case, You can click on Advanced and proceed to the website. 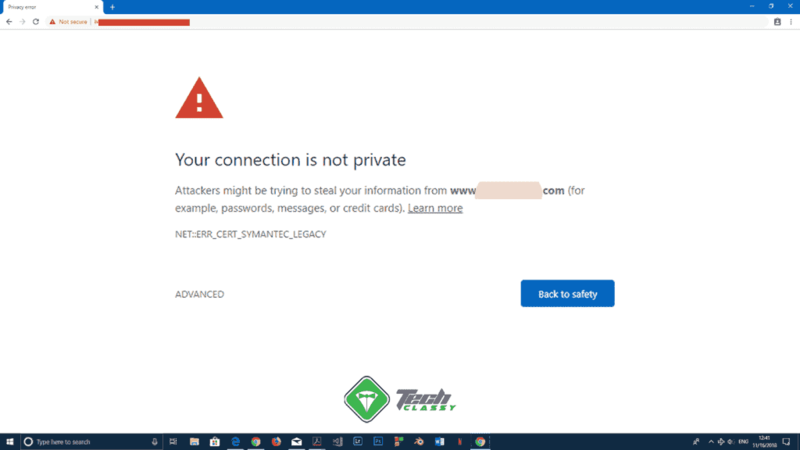 Then, Find the contact page and let the website owner know that you and other chrome users are encountering the NET::ERR_CERT_SYMANTEC_LEGACY. He/She/They should fix it. The webmaster may replace their certificate with a new one and it will solve the problem. As Chrome 66 and later versions don’t support old legacy Symantec certificates anymore, you can use other browsers to visit the webpage. In this case, Microsoft Edge can be an option. But, You never should do e-commerce transaction or anything sensitive in that website as that is vulnerable. These are the options to fix ERR_CERT_SYMANTEC_LEGACY error on Google chrome. If you wish to add anything, let me know in the comment box.